Czech Republic and Poland have withdrawn from the race to become a host for the Euro 2020 finals, on the eve of Scotland launching its bid. Uefa's continental championship will be staged in 13 different host cities. The Scottish Football Association will formally launch its campaign for Glasgow to be one of those at a Thursday morning news conference. But Prague, Warsaw and Chorzow have dropped out of the race ahead of Friday's deadline for candidate bids. Prague had been hoping to host three group-stage matches and a quarter-final. The Czech FA blamed the lack of financial guarantees from city authorities for the withdrawal. Prague authorities had earlier described its football federation's Euro 2020 project as "incomplete". Poland were Euro 2012 co-hosts alongside Ukraine but their football federation withdrew from the 2020 race after rating the prospects of its two potential venues being successful as "minimal". England, Republic of Ireland, Scotland and Wales were among 32 member countries who told Uefa in September that they had an interest in hosting games. 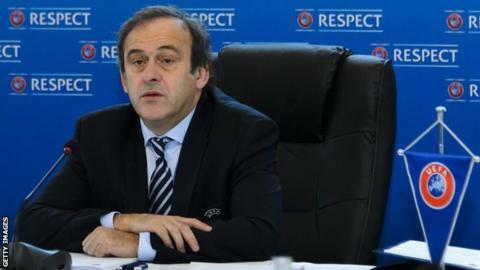 Euro 2020 bid dossiers must be submitted to Uefa by Friday, with European football's ruling body, under the leadership of president Michel Platini, set to announce the winners in September.